It’s February: a month short on time and short on seasonal fruit so what better pie to make than a no-bake, peanut butter-fudge affair? The recipe came from a book that’s been in my collection for quite some time and hadn’t been cracked in a good number of years –The Baker’s Dozen Cookbook: Become a Better Baker with 135 Foolproof Recipes and Tried-and-True Techniques. 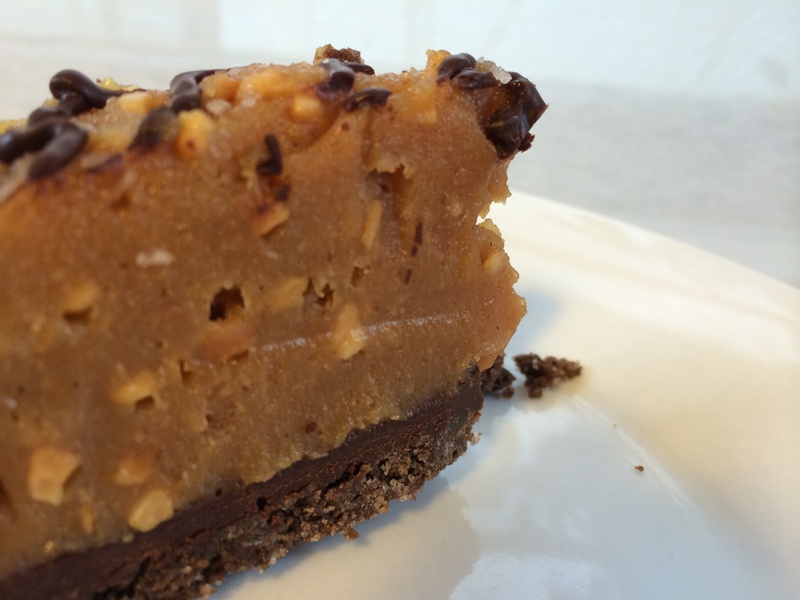 The recipe is a simple, trend-free, classic — sugar, peanut butter, chocolate. Done. I used crunchy peanut butter from my local organic co-op grocery store, which did not produce the creamy, homogenous consistency I was expecting — but was still darn tasty. Next time, though, I’ll go with the good ol’ American grocery megastore brand peanut butter. Finally, I couldn’t help myself, I had to finish it with a healthy sprinkling of Maldon sea salt to make this pie of this time. Last summer during the peak of berry season, I sacrificed a generous load of farmers’ market blueberries from our usual summer, raw-berry eating, bacchanalia to make a pie. I made the blueberry pie from Leslie Mackie’s Macrina Bakery & Cafe Cookbook: Favorite Breads, Pastries, Sweets & Savories and Dylan hailed it “the best pie he’d ever eaten.” The crust was a revelation and defied expectation, being at once hearty, thick, and oh so tender. This crust flaked at the mere suggestion of fork or knife. The berries were lightly spiced with cinnamon and cloves and produced a pie with prodigious, shirt and teeth staining juice. This was a pie for a pie lover with no concern for bound up fruit and neat edges. Then again in November, Dylan and I teamed up to make a nearly perfect pecan pie for Thanksgiving and I was reminded again of how much I love pie making. So what went wrong? I botched the crust, which I think went mostly unnoticed by everyone but me and Dylan. Specifically, I over processed the flour and fats and the crust came together in a homogenous mass that produced a tender crust, but much too sandy rather than flaky. The near perfection of that pie inspired my 2014 resolution to make a pie or tart a month. This 2014 resolution is meant to get me back in tune with pie making, to practice, to regain the ability to see two steps ahead in the baking process, to make better decisions. Wow. 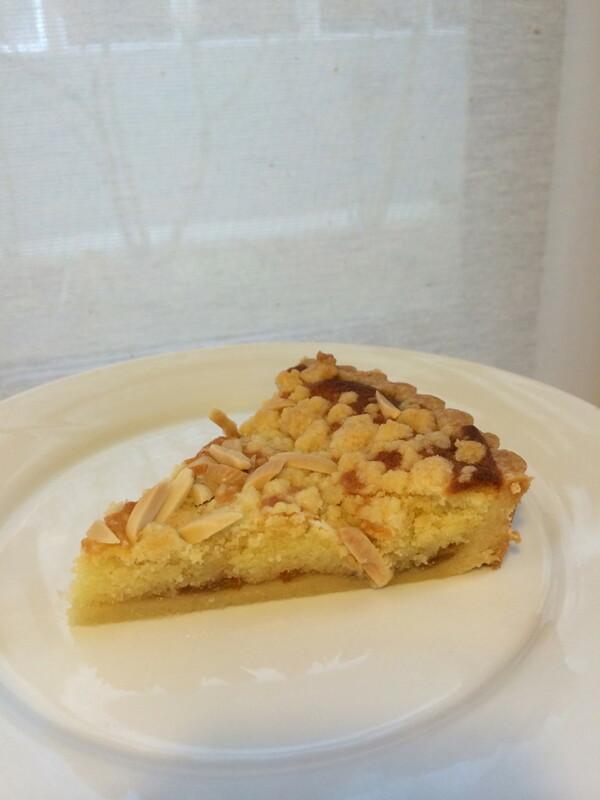 And here is January’s effort — Almond Marmalade Tart. A pressed-in shortbread crust, a smear of fine-cut marmalade, a decadent almond cream, shortbread crumble, and a smattering of slivered almonds. The tart is a mashup of two recipes: Italian Jam Shortbread Tart from Food52 and the almond cream portion of a recipe from David Lebovitz. I picked the shortbread tart recipe for the base and crumble and its ease (i.e. it didn’t call for a pre- or par-baked crust), but I wanted it to be a little more than just jam and crumble. Since I had a good amount of almond paste kicking around my refrigerator, I settled on amending the tart with an almond cream. The results were good. The almond cream was fantastically almond-y, puffed, and light. The marmalade added a nice bitter balance. But the bottom crust was a disappointment — underdone and pasty. That’s what I get for going against my better judgement and numerous, similar recipes calling for pre- or par-baked shells. I’d love to make this again someday and will definitely take the extra step to bake that base. It feels like it was a year of some good cooking at my house. I bought at least 25 cookbooks and probably cooked from 12? There were some gems this year and here are those that I can recall, in no particular order. Had the family over yesterday for brunch to celebrate my sister in law’s birthday. It was a great exercise in excess and lots of prep the night before. My sister made the cinnamon rolls, which were light and buttery and absolutely divine. It was a good menu, not too brunch cliche, a bit on the excessive side with three bready items, but it was a celebration, so more bread please! The baked french toast and breakfast strata were great prepare ahead items that went into the oven about an hour before breakfast. The juice cocktail was something I’d like to do more of – what I was looking for was something refreshing and non-alcoholic, but exciting to look at and sip. I kept the apple juice and beet juice separate and mixed the celery, fennel stalks (left over from the salad), and ginger. I was hoping for a very light, pale, pale green base with a striking float of beet juice. I started with a mixture of apple juice with the celery mixture, some lemon San Pellegrino soda to brighten it up, and about of tablespoon of the beet juice right on top. The beet juice did exactly what I hoped it would — just floated right on top. The green wasn’t as pale as I had hoped, but it tasted dang good. I’m finding more and more that what is lacking in cookbooks and food blogging/writing are menus or ways to combine items to round out a meal. While I like to think I know how to combine items into a satisfying and well composed meal, I’m not so sure that I do. In eating and cooking and life in general, I’ve been thinking about this a lot — how do I compose and combine and edit for balance. I hope to see a verrine trend. 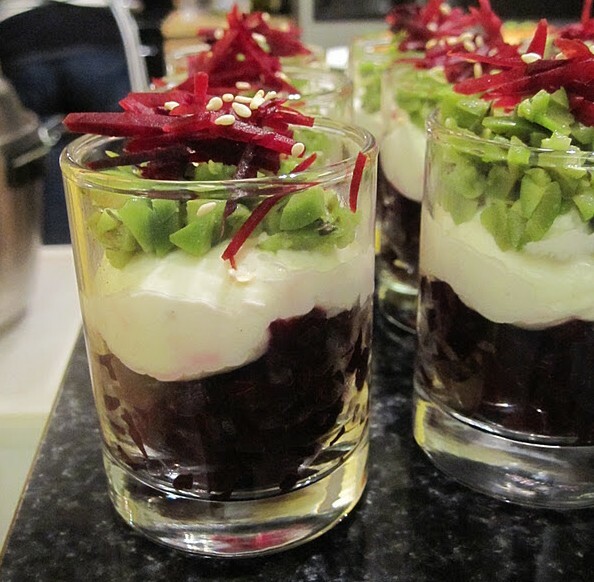 Ours has beets, goat cheese mousse, cerinogla, and sesame. I’m turning 39 in too few days. I don’t like the sound of it, I’m very uncomfortable admitting it, but that’s the way it is. And there, I said it. Does it mean something to turn 39? It feels like it means something to turn 40, most surely, but 39? It has been weighing on me as I feel I need to accomplish something “meaningful” before I exit my 30s, so as not to feel that I wasted an entire decade. Your 20s are for wasting and figuring it out and your 30s are for getting it done, right? I succeeded in wasting my 20s, but didn’t manage to figure anything out. My 30s were a scramble to figure something out, try to make things right, and hurry to get it done. But I’ve always been bad with time. I am a tortoise, molasses, a tough cut braise. Slow. Really slow. I will be celebrating my 39th birthday in NYC, having dinner at Per Se. It is a luxury that will make me more fully appreciate being almost 40. I most certainly would not have been able to afford that meal in my 20s and my 20-year-old self would balk at the extravagance. But I know that when I sit in that dining room, I won’t feel that awkward crush of being the youngest, or most poorly dressed, or most inexperienced diner in the room. I still bear some cache of youth, but with a respectable burnish. I’m looking forward to that dinner. So much time spent trying to be a good worker bee, a person of normal height and weight, a person who can pluck a vegetable or herb from the yard, and a person who tries to read more than headlines … so much time spent trying, wishing, hoping. 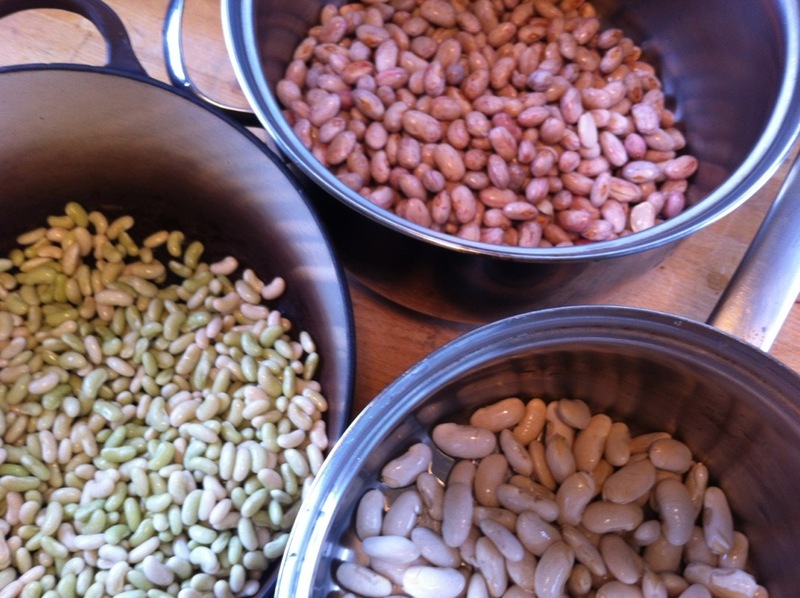 Inspired by the Smoked Heirloom Bean Cassoulet at Tilth here in Seattle, I set out to smoke some beans on a foggy, chilly Seattle afternoon: cranberry, cannellini, and flageolet. Likely brought on by the new year thing and Netflx recommendations, I’ve spent a fair amount of time in the last several weeks watching documentaries on the obesity epidemic in the US and nutrition as medicine. The best of the bunch were Food Matters, Forks Over Knives, and Fat, Sick, & Nearly Dead. The gist of the films is that we Americans are in crisis, diseased by our food habits and our institutions. It’s a nasty state. But what to do (or not do)? Do juice, do vegetables, do raw, do supplements. Don’t do milk and dairy, don’t do meat, don’t do processed foods. Being a former vegetarian, these films made me question my decision to start eating meat again. Will I go back to vegetarianism? No, not in the strict sense that I once adhered to. I like being mostly vegetarian, a sometimes vegan, an occasional carnivore. It is pure joy to consider the limitless flavors, textures, aromas that I now allow myself. I am fortunate to have the means to eat good food, really good food, I love cooking, and a spinach salad brings me as much pleasure as pastrami … well, almost. 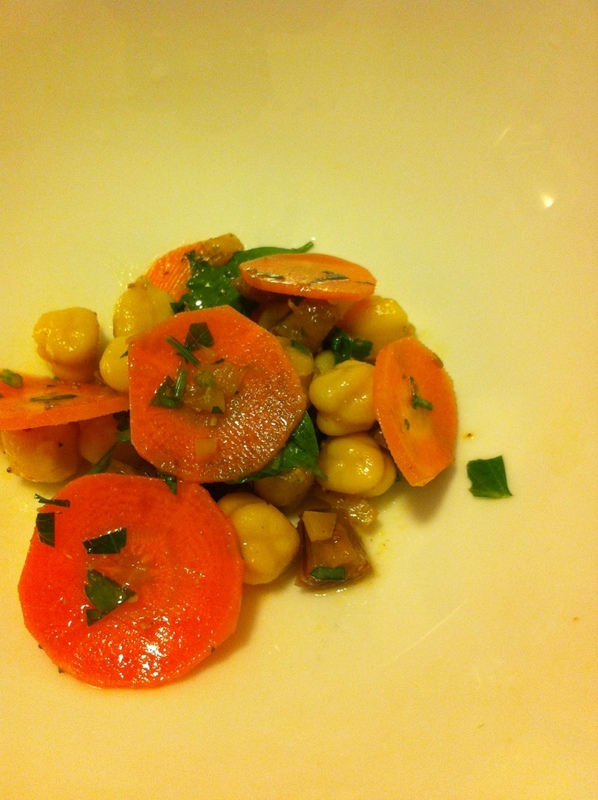 So in this year, I hope to better document the richness that is my eating life, starting with the spectacular salad that was my lunch today from 101 Cookbooks: Moroccan Carrot and Chickpea Salad. I used harissa in the dressing in place of cayenne and added a good dose of diced preserved lemon. Bought the point end of the brisket, because it looked like a big, thick ol slab of meat. Should have bought the flat. Ended up trimming about 25-30 % of it off because it was fat. Bought a one-pound bag of pink salt on Amazon, but the butcher sold smaller amounts. Need to return the pound bag to Amazon. Dirtied too many pots to arrive at the right one for brining. Regular stock pock was big enough for the <5-pound piece. Smoker is running hot. For the about the first 30 minutes, it looks like it’s been at 300. Turned the flame down a bit. First hour in smoker at about 300. The pastrami is taking on a golden color. After an hour the wood chips were gone, but there were a few big, blackened chunks left. After 90 minutes, the temperature has gone down to about 275. Added more wood chunks and chips. Internal meat temp is about 130. Color is getting darker. More deep brown now than golden. Meat is also tightening up and getting shorter and thicker. After two hours, the temperature has remained around 275. Internal meat temp is about 136. Turned meat over. After two hours, 3o minutes, the temperature was just shy of 275. Internal meat temp is about 145. Smoke died down quite a bit and water in pan had reduced to 1/3 and was bubbling. Added a little more water and more chips for last 30-6o minutes of smoking.